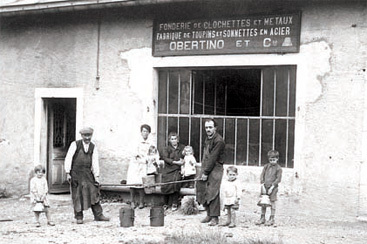 Bronze bells manufacture has been intimately linked to the Obertino family for over two centuries. At first they were itinerant bell foundry workers in Italy and Switzerland before settling in France in the early twentieth century and in Morteau in 1931. Thus several Obertino generations have perpetuated this secular expertise to these days. Today, Yves and Sylviane Obertino are the worthy successors of this family saga. More than 200 different models of bells are made in the strict respect of tradition in the small traditional foundry in Morteau. 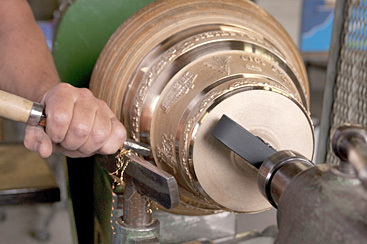 From the small souvenir bell to the cattle bell to the medals or the bas-reliefs, each product is molded manually before being melted down and decorated by hand. All the bells manufactured at the Obertino foundry which has been recognized as a "Living Heritage Company", since 2011 can be customized on request. The chosen model of the bell is placed in the main part of a frame. It is covered with sand compacted with a rammer, to obtain the outer impression. Next, this first part of the frame is returned to be embedded in the second and then the operation is repeated to fill the interior of the model. After drilling the tap holes, the two parts of the cast are separated to remove the model. The decoration and inscriptions are then applied to the outer impression and the two parts of the cast are assembled together. 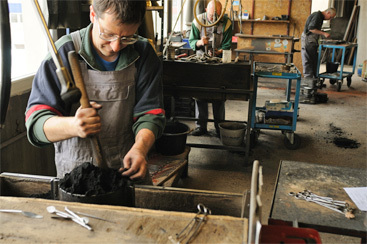 A graphite crucible containing the bronze (an alloy of copper and tin) is put in the furnace. 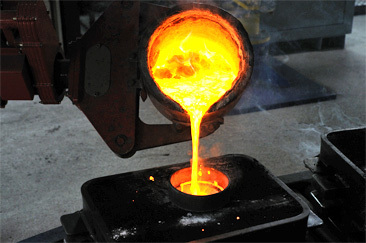 When the temperature reaches 1200 ° C, the molten bronze is poured into each mold. Minutes later, the bells are removed from the mold. The bells are then trimmed and tours to make them look smooth and shiny.